Most weekends, I tackle one significant project around the house, usually with the goal of saving money or learning how to make or do something myself. Usually, I think to myself “This would make a good post for The Simple Dollar” (and sometimes I go ahead and do it) but most of the time I find something more money-oriented to talk about. Today, I had an epiphany: why not just compile a bunch of those projects into a single post, along with links to some resources to get people started? I made up a list of the projects I’d done recently and some of the ones I have planned for upcoming weekends – and here they are, five projects for five weekends. I guess you can interpret this as a peek into how I spend my spare time with my family, as they’re often involved in these projects. Most of these save money – the rest largely break even and also educate me on how something works, so I figure it’s a wash. In any case, they provide quite a bit of entertainment over the course of a weekend. One great weekend project I like to engage in is brewing my own beer, which you can see the results of above. 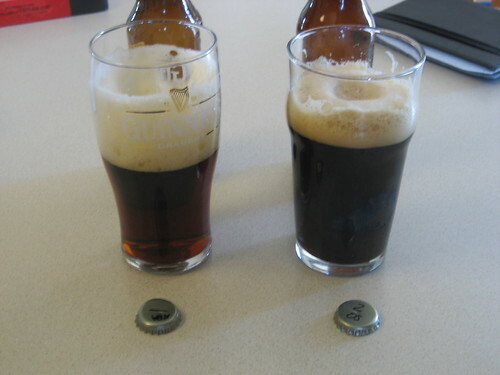 On the left is my homemade nut brown ale, and on the right is my homemade oatmeal stout, based on this recipe. Compared to the cost of similar craft beers, homemade beer making is a wash, but I’ll say this: it tastes better than any beer you can purchase and you can customize it to your heart’s content. All you really need is a large pot to brew stuff in, a large container and a bubbler cap to ferment it in, some tubing to siphon it out of, plenty of bottles and caps, a crimper to put the caps on the bottles, and whatever ingredients your recipe calls for. 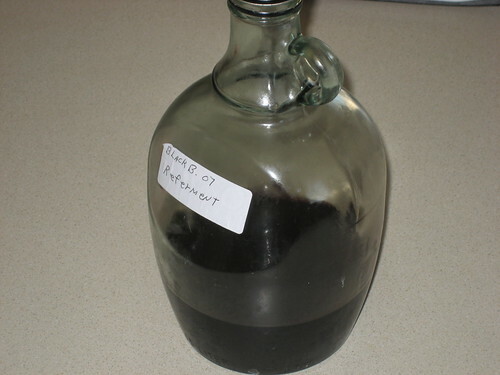 You just boil up the recipe, pour it in the container, put it in a cool place to ferment for a few weeks, then siphon it out into bottles – that’s it. We often bottle a batch on Saturday, then brew up another batch on Sunday, then leave it in the basement for several weeks to ferment and settle. If you’re interested in trying this out yourself, I highly recommend the excellent book The Complete Joy of Homebrewing by Charlie Papazian. It’s taught me everything I know about making my own beer – and Papazian is an entertaining writer, too. Never mind the messiness on the shelves (I need to go through some of that stuff, really!). The shelves themselves are very sturdy and incredibly cheap. All I did was collect some 1″ by 8″ boards and cinder blocks. These can be had on Craigslist or Freecycle if you’re patient or if you ask for them. Then, I just stacked them into shelving units, easy as can be. 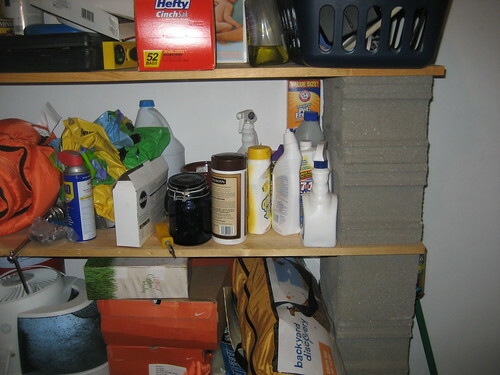 No need to spend money on utility shelving out in the garage, is there? Of course, this leads to another project: cleaning out those shelves. There’s a lot of camping supplies that need to be put up for the winter, some tools that should be put in their place, and so on. Another weekend project! This is actually a hobby I picked up from my father, and in fact the picture above is a bottle of his 2007 blackberry double fermented wine (which is unbelievably good). He’s got a knack for it picked up from many years of winemaking – I’m still a novice. Winemaking requires most of the same items as beer making, but also a lot of fruit juice (preferably grape juice, but why not experiment?) and a lot of patience. The procedure is much the same, too – juice and yeast in the container, let it ferment for a long while, then siphon it off into bottles. If you just buy your own grape varieties and crush them yourself in a strainer, it’s actually quite a bit cheaper than buying your own wine, too. If you’re interested in getting started in making your own wine, my father and I both recommend The Way to Make Wine by Sheridan Warrick. It’s been essential for me as I learn more about this process (which I freely admit to being a novice at). 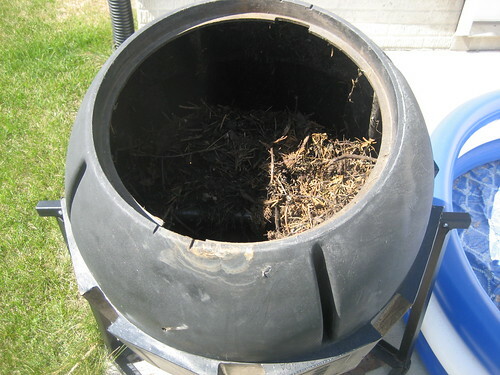 Pictured above is my barrel composter. It’s basically a barrel on legs that can spin in the middle – it has a lid, too, of course. My wife and I put some of our yard clippings and most of our vegetable waste (as well as egg shells) in here and occasionally spin it. It rarely smells very bad at all – the “bad smell” usually comes from meats and other things that shouldn’t be in there. Usually, it smells sweet or earthy. Once we have it largely full, we “season” it for about a month. All that involves is putting in a few shovels full of dirt from our garden, some water, and sometimes a few earthworms, then rotating it every day and watering it again if it seems dry. 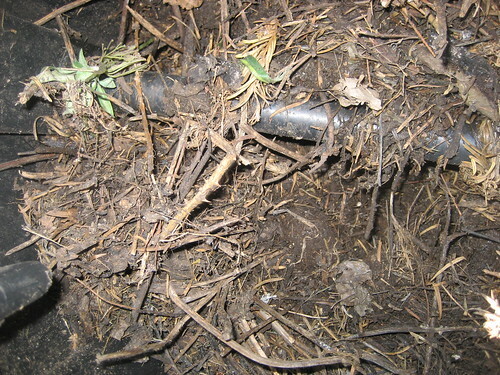 Doing this allows the compost to decompose, eventually becoming much like a heavy, black soil. Then comes the “weekend project” part: we spread it on our garden. We usually do this twice a year or so, in the spring just before planting and in the fall when the plants are done. … you’ll see it’s very dry. It mostly just looks like dirty plant parts – and that’s what it is. Earlier in the summer, during the heavy Iowa rains, it got fairly wet in there and did some decomposition on its own. Now, in the late summer, it’s dried out. Soon, I’ll add a bit more garden dirt and some water to help the rest turn into compost. My guide to composting has always been Rodale’s Organic Gardening, which has basically been my guide to gardening my whole life. My father has subscribed for years and I tend to read his issues thoroughly, as well as sometimes investigating them at the library. My next big investigation is into making homemade cheese, mostly spurred on by Barbara Kingsolver’s eloquent description of it in her book Animal, Vegetable, Miracle, and my mother-in-law’s experience as a professional cheese maker. Why? I’m mostly interested because I want to gain a better understanding of what goes into my body. What are the components of cheese? How is it made? I’m starting off by making the very basic mozzarella as described in Kingsolver’s book, which you can get the recipe for at that link. The only ingredients are citric acid, rennet, and non-ultra-pasteurized milk – and two of those ingredients are in the picture above. After that’s done, I want to attempt other cheeses, including ones that have to age for a while. 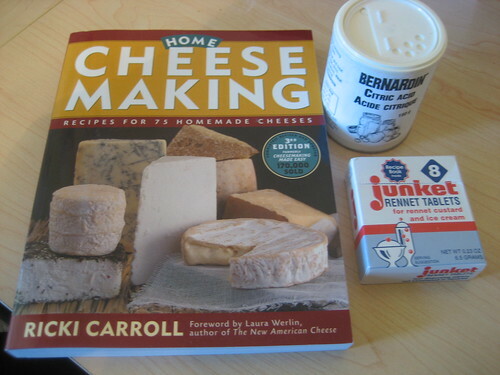 I’m following Kingsolver’s suggestion and using Ricki Carroll’s Home Cheese Making as my guide. It should be fun. , let me know in the comments. I’ll be glad to investigate any of these in more detail if there’s interest.